Awaken your senses with our Invigorating Bath Salts. These sweet floral scented salts are the perfect addition to a morning bath to refresh you for the day ahead. Morning Bath Tip: Run the bath water on the cooler side (while still keeping it comfortable!) for an exhilarating way to start the day. 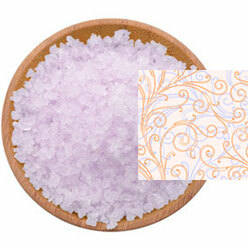 A fine/medium grain blend of Pacific Sea Salt with a soft, floral fragrance and a light purple color. Ingredients: Pacific Sea Salt, Fragrance, Glycerin (Vegetable Glycerin), Tocopherol (Vitamin E), Aloe Barbadensis (Aloe Vera) Leaf Juice, FD&C Red 33 Lake.